The author of “White Hot Truth” shares her current passion. 24Life: What are you most passionate about (outside of your primary work)? Danielle LaPorte (DP): There aren’t any lines between my work and my “life,” really. If I’m passionate about something I want to get it on my platform and raise some love for it. Right now I’m thinking about what I can do to bring attention to our major over-use of plastic. If you do your homework, you’ll quickly find out that plastic is choking the planet and really affecting our health in big ways. It’s messing with our hormones and digestive systems, it’s poisoning oceans and all kinds of wildlife. We’ve got enough plastic on the Earth right now that we don’t need to be making any new material. We could recycle what we have and use it for centuries. We need to change our behavior because we’re essentially becoming a shrink-wrapped species. 24Life: What’s your secret to getting stuff done? DP: I know why I’m doing what I’m doing: to express myself and be of service. The inspiration is really simple and it makes it easy to know what to say No, thank you to. 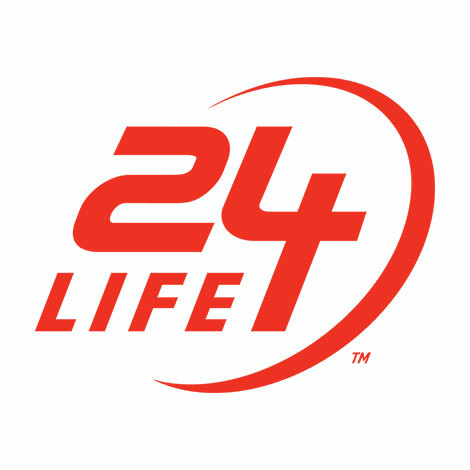 24Life: What’s your power food? DP: Celery juice. And potato chips. Depends on the day and my writing deadlines. 24Life: What’s your no. 1 stressor and your no. 1 stress-buster? DP: Going to bed too late is my biggest wellness challenge. It’s a full-on struggle for me to shut it all down and get my 7 ½ hours. And I find that one less hour of sleep at night messes with my clarity and energy. The remedy for this of course is being a self-respecting grown-up with healthy boundaries and getting enough sleep, because I know this: Sleep is the greatest healer. 24Life: You have 24 minutes to work out. What do you do? DP: If it’s raining, I hit my elliptical: two to four minutes of full-tilt effort, one minute of easy interval. The better the music, the faster I run. If it’s sunny out, sometimes just a steady 3-mile walk around my neighborhood lake—and I leave my phone at home. Radical. 24Life: Best advice you’ve given or gotten, in 24 words or less. DP: Let it come to you. 24Life: Thoughts on mothers, in advance of Mother’s Day? DP: I have a lot of women asking me about if they should share their brand, their form of spirituality with their children. To which I say, you have worked decades to figure out what works for you. You had to let go of all the lies and unlearn stuff and come to your own practice of faith and wellness, whatever that is, and now you’re not going to fully give it to your children? No, your job is to brainwash your children with your holistic viewpoint because no matter what you say to them, they’re going to totally roll their eyes, it doesn’t matter what the philosophy is. So, you may as well just be free and really [take] a stand in your beliefs, whether that’s essential oils or sugar-free living or to dragging your kid to yoga. Whatever it is for you, be fully that. That is how you model for your children what it means to be really alive. And yeah, I drag my kid to yoga. Subscribe to Happy Hour, the 24Life weekly newsletter, for an exclusive chapter from “White Hot Truth”!